In July 1844 Ngāpuhi chief Hōne Heke organised the felling of the flagpole above Kororāreka (later Russell) in a protest about unfulfilled promises of British colonisation. He had gifted the flagpole so that the United Tribes' flag could be flown, but following the signing of the Treaty of Waitangi the Māori flag was replaced by the Union Jack, to Heke’s displeasure. After his initial attack, the pole was re-erected, but Heke chopped it down again. When it was felled for a third time, the new flagstaff was clad in iron. 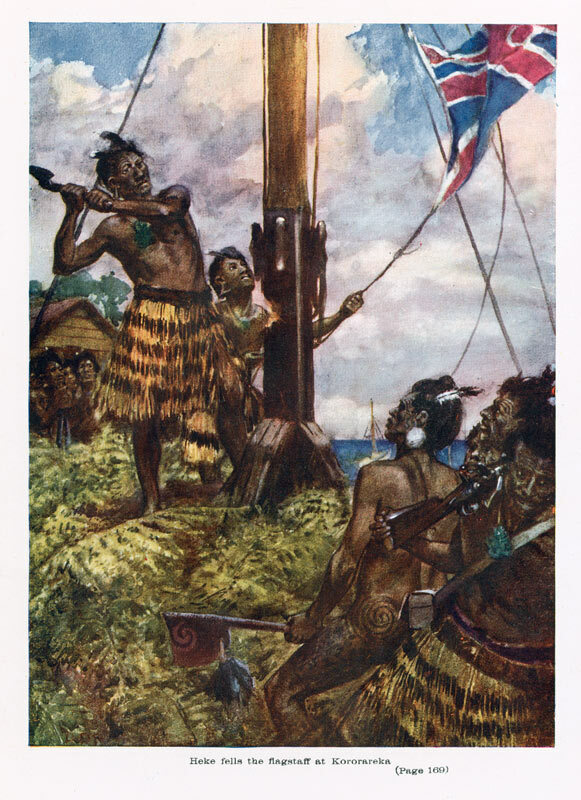 During Heke’s attack on Kororāreka in March 1845 the pole was cut down for a fourth and final time. This 1908 painting depicts the fourth felling.